The United Kingdom pavilion is a bustling destination. Through the seamless blend of architecture that takes you from the streets of London to an English cottage, the essence of this nation is yours to enjoy. Cobble-stoned streets, a quaint pub, the scent of fish and chips in the air combine to make this an authentic “trip across the pond. The regal Hampton Court Palace is represented, as well as buildings reflecting the Tudor, Georgian, and Victorian influences that the United Kingdom is noted for. Prized among them is a thatched roof cottage, which is patterned after Anne Hathaway’s. While the more contemporary among you may associate the name with the star of Disney’s Princess Diaries films, Anne Hathaway is the wife of William Shakespeare. Her family home is considered the quintessential English cottage. No detail is missed. 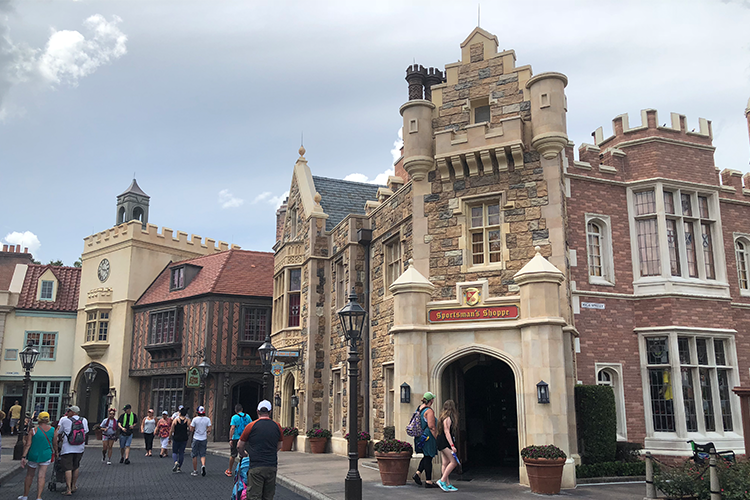 There are soot-stained chimneys, a wonderful gazebo, beautiful gardens and perhaps the most photographed items in the World Showcase, replicas of UK phone booths. You can’t miss these bright red structures, nor will you be able to resist taking a picture of them. While there is no “attraction” at the United Kingdom, there is entertainment with a decidedly British flair. The World Showcase Players are an improvisation group who engage visitors in their hilarious skits. An acoustical group, Quickstep plays every Wednesday through Sunday. This four-person group plays the fiddle, flute, highland bagpipes, an Irish frame drum and more. Their songs draw from Scottish, English and Irish influences. The band British Revolution performs every day for 30 minute sets. Guests will love the iconic sounds from bands like Led Zeppelin, Queen, The Who, The Rolling Stones, and so much more! You can head to the Yorkshire County Fish Shop booth and enjoy your meal at a table overlooking the World Showcase lagoon. If you’d like, you can get a yard of ale at the beverage stand located outside the Rose and Crown as the perfect accompaniment to your snack. Traditional pub fare is found at the "Rose and Crown Dining Room." Guests can feast on such specialties as cottage pie, Fish & Chips, Bangers & Mash. Finish off the meal with a delicious English trifle. A variety of beers and ales are offered in this charming little pub with the wooden flooring and pressed tin ceiling. Entertainment focuses on music - guests are encouraged to sing along and make song requests. The pub is located on the shore of the World Showcase lagoon. A live Musician will perform smashing tunes from pubs all around the United Kingdom inside the Rose & Crown Pub at 1:15, 2:15, 3:15, and 4:15 p.m. daily. Times are subject to change; check the daily Times Guide for details. TIP: This is a great place from which to view IllumiNations. The shops feature the treasures of various regions of the United Kingdom. In “The Toy Soldier", medieval castle playsets, swords & shields, real feather quills, and UK themed childrens' books and movies are found. This store is also the Kidcot Fun Stop for the United Kingdom. "The Crown and Crest" is the place to find your beer stein, glass or mug with the crest of your favorite UK country. They also offer Rose & Crown t-shirts and hats along with a great selection of Beatles merchandise. An array of swords, daggers, and knives are on display near the room of Family Crests. In this section of the shop have your Family crest placed on a ring or plaque; or, have it embroidered and framed. "Fancy Goods for Lords and Ladies" offers perfume, cologne, jewelry, and body care to fit all budgets. The brands available include Kit Heath Celtic jewelry, Asprey of London frangrances, and Feel Good Formulas Body Care.